VietNamNet Bridge – While foreign retailers have been unceasingly expanding their business by setting up more retail stores, domestic have to scale down their business because of the big losses. There are 130 shopping malls, 700 supermarkets and 1,000 convenience stores nationwide. Domestic enterprises account for the overwhelming majority among the operational retailers, while there are only 21 wholly foreign invested retailers and some joint ventures.However, the modest number of the foreign invested retail enterprises have been dominating the domestic retail market. Metro Cash & Carry, Casino, Lion Group, the groups which have been succeeding with Metro Cash & Carry, BigC, Parkson brands present in Vietnam since 2000s, reportedly have been enlarging their networks continuously. It is estimated that each of them open 2-3 new shopping centers every year. The French retailer Casino, for example, has had 18 supermarkets so far, while Metro has 19 in HCM City and many other provinces and cities. Most recently, the South Korean Lotte has bought all the stakes of Minh Van Company, a partner in the joint venture with Lotte, officially becoming the 100 percent foreign owned distributor. Since late 2008, when Lotte joined the Vietnamese market, it has opened four shopping malls in its plan to set up 30 shopping malls in the next 10 years. The US Circle K, after two years of operating in Vietnam, has had more than 20 convenience stores. Zen Plaza, Family Mart, Ministop, Diamond Plaza, Dairy Farm have also been developing their networks to expand their market share. In early February, Starbucks, the well-known coffee brand, opened its first shop in HCM City. McDonald’s has revealed that it would make presence in HCM City in 2013 and has drawn up a plan to develop six shops here in Vietnam. Vietnam has been weeded out from the list of the 10 most attractive retail markets in the world. However, a lot of retail giants such as Tesco, Wall-Mart, FairPrice are reportedly still moving forward to penetrate the Vietnamese market. Meanwhile, the South Korean Emart has announced that its first retail shop would be set up in Vietnam in 2013. Not only competing with domestic invested supermarkets, foreign retailers have also “declared war” with traditional markets, which are believed to be the most redoubtable rival because of the capability of providing fresh food and vegetables at low prices to consumers. The foreign retailers have been following the special strategies to compete with traditional markets to attract customers. After developing New Cho chain, Big C now moves ahead with the opening of a series of C Express shops. C Express proves to bear more Big C’s features. 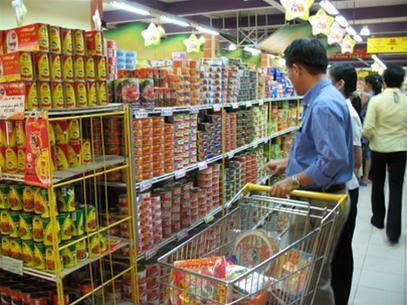 The shops display the products bearing private brands, mostly essential goods, from rice, instant noodles to soft drinks, vegetables and meat. Especially, each of the shops of this kind only covers an area of 100 square meters, which allows to save costs, and they are located in residential quarters to be competitive with traditional markets in prices. Metro Cash & Carry, the supermarket chain which introduced itself as a wholesaler when setting foot in Vietnam, has quietly turned a retailer. The consumers with no admission cards and children can also enter the supermarkets just to buy some product items. As such, Vietnamese retailers now have one more foreign retail rival which has powerful financial capability and much experience. Especially, Metro shops are located near residential quarters, which would be a big threat to the retailers nearby.